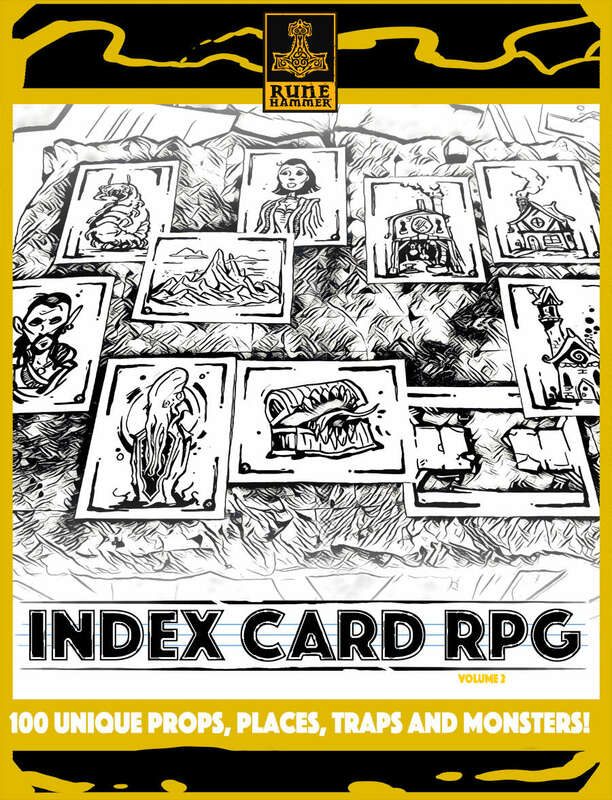 INDEX CARD RPG gives you 100 unique pieces of dungeon art for your tabletop! Print and cut places, props, monsters, traps and more. Use as terrain, monster mini's, or as a story and dungeon building creativity tool! Just two easy cuts per page makes 4 cards. Also included is a full card title and description listing to get your devious imagination turning! Volume 2 takes ICRPG to the next level with dozens of player-suggested cards and themes including a full set of buildings and npc's to build towns, more locations, and story-laden details and props. Play your way! UPDATE! ICRPG Volume 2 now also includes a print-cut-fold set of MONSTER MINIATURES for all monsters in the Volume! Download teh new PDF for no charge, and get crafting! Does this also include Online assets for Roll 20 or Google Hangouts? love the art on these cards but after cutting them on the "cut lines" they are all different sizes?? anyone else have this issue? Is there any chance of a physical copy of these two sets being made available for purchase? I'm blown away with the customer appreciation of providing further content to existing products. Amazing work, Runehammer Games. Most printers can print on 3x5 or 4x6 like mine and I have hundreds of cards ready to use. This issue is then trying to scale letter size with 4 images into poster on 4x6 index cards. It came out okay but half have extra space on the top and the other half has it on the bottom. What if the images were single page? Then you could use the printer dialog to print as many as you want per page. I have both versions and would be glad to test this. Excellent resource! Sorting the cards I printed and different volumes need different numeric designators; i.e. volume one could be 01-100, and volume 2 could be 101-200, or volume 1 could be 1a-100a, volume 2 then 1b-100b, etc. Is there a chance of a print version? Ala DriveThruCards? Thanks! Sweet, especially with cut-lines, I am getting in on this one too very soon! I like the first set and made my own 180 card deck to go with it! I actually went seeking specific building types myself, so it's nice to see that you are on the same wavelength! Keep up the good work! Funny. Just bought this, but unfortunately I can't rate it. It still says: You must buy it to rate it. I think it's even better than the vol.1, because now it has separator lines between the four cards on the same page (as I wished for the first volume). Well done, very evocative. And as a plus good colorful descriptions of the cards. I'm waiting for additional volumes. Check your product updates. The first set added the lines a couple of weeks ago. If you bought volume one, go and look again, it has been updated to include the easy cuts and card numbers! You are listed as a "Purchaser" now, so maybe it just takes awhile. Log back in and try to rate it now.